THE GUINNESS CORK Jazz Festival is one of the most iconic festivals on the national cultural calendar, sending crowds flocking to the Leeside city every October bank holiday weekend. But this year, after over 40 years, the festival is getting some new life breathed into it, thanks to Festival Director Sinéad Dunphy. As the new woman to take over the show, Dunphy says her job is about “coming in after 40 years and starting afresh and breathing new life into it”. That doesn’t mean throwing out what’s been done before – for Dunphy, it’s about building on what’s made Guinness Cork Jazz a success for all these decades. “For me, a major part of it has been I’ve been a punter of the festival and a massive fan of the festival for years,” Dunphy tells TheJournal.ie. She said she wants to”[make] sure that I bring honour to the festival”. What she decided to do was fill the festival with stellar headliners from across the jazz genre. One was the Maria Schneider Orchestra, a big band which has never played Ireland before. That was Dunphy’s starting point. Other big draws are Billy Childs, Nnenna Freelon, the Hypnotic Brass Ensemble, Laura Mvula, Linley Hamilton and Blind Boys of Alabama. “These were the stellar artists, I was determined to secure them and make sure it was the best festival I could produce,” says Dunphy. That meant much crossing of fingers and hoping that tour dates would enable bands to visit. Dunphy says she’s been honest from the start with the artists and their team that it’s her first jazz festival. Her work also included looking at the fringe festival element of Cork Jazz, while in addition to this, she brought in new educational elements and partnerships. For example, a jazz standard youth orchestra from Cork – the CSM Youth Jazz Ensemble – is taking part in a project with the New York Jazz Standard Project, and the groups will perform at a family jazz event on Saturday 27 October. For the first time, the festival will also have an artist in residence, trombonist Paul Dunlea. “The festival is so massive in its reputation, but to be able to actively take part in the development of a musician’s career and support that career are massively important things,” says Dunphy. That’s the backbone of my vision as to how the festival is going to move forward. Not only bringing stellar headline acts, but also creating headline acts for the future. The festival will also utilise Cork City Hall for a number of its big name events, which Dunphy is particularly excited about. The events aren’t all ticketed – there are quite a few free events, including the Dia de los Muertos Parade on Thursday 25 October, which will include improvising jazz musicians. Including all the many elements of jazz is high on Dunphy’s list. “The beauty of jazz is there is something for everybody,” she says. Having spent years working in the cultural side of Cork – from managing bands to working in the Opera House to programming the Cork International Choral Festival – Dunphy is more than equipped for this new stage in her career. 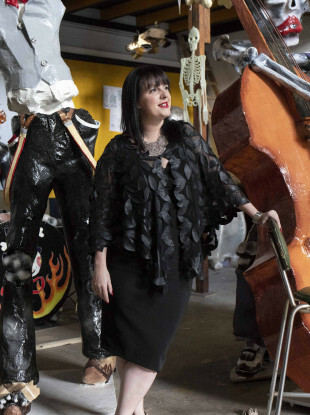 Email “'We're starting afresh': Meet the woman breathing new life into Cork Jazz Festival after 40 years”. Feedback on “'We're starting afresh': Meet the woman breathing new life into Cork Jazz Festival after 40 years”.